This page may load slowly--there are slide shows to view! 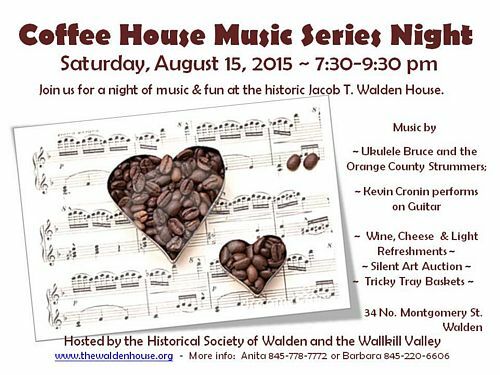 1-4 PM House Tours at the Jacob T. Walden House. 2PM, Mickey Millspaugh's presentation of "The Black Hand Murder." 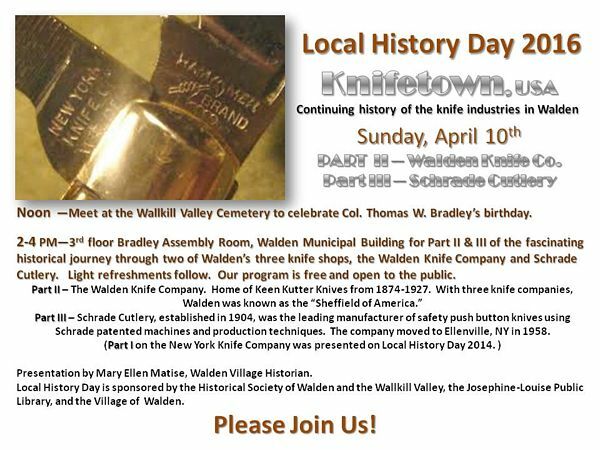 at 15 Wallkill Avenue, Wallkill.. 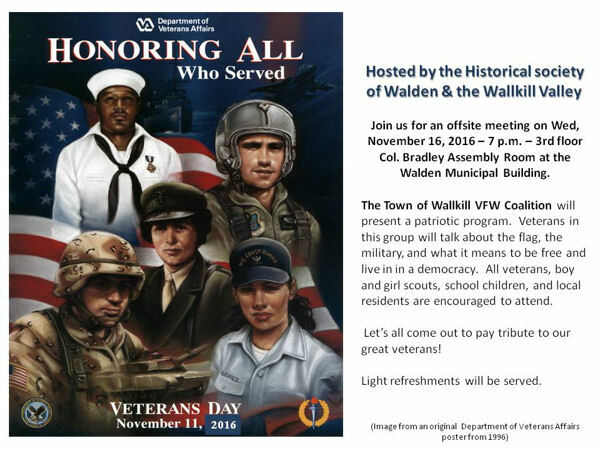 Thank You Wallkill VFW Coalition! 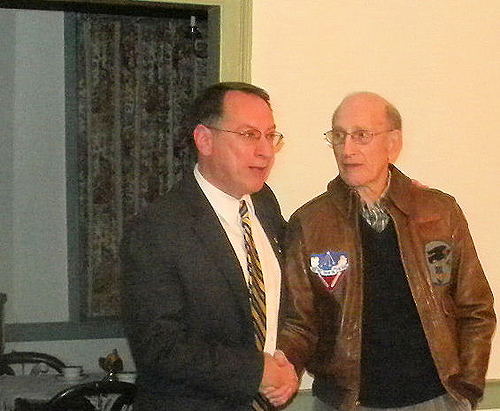 Walden WWII Veterans, David C. Lustig (left) and Vito Imbasciani (right). It was a Fun Fundraiser! Congratulations to Helen Tighe who won 1st Place! Bruce Hotaling & Nancy Ohlmer for planning this really creative event! To see all the photos from this event, please see our Facebook page. 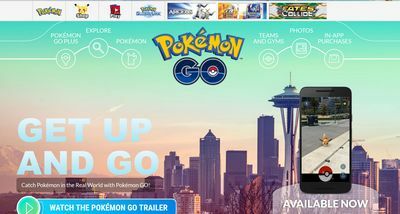 (Photo courtesy of the PokémonGO web site.) Thanks PokémonGO! Our Jacob T. Walden House is included in the new game as a PokéStop! Players are discovering new places, accidentally exercising, and meeting new people. Right now it's on track to surpass Twitter in daily active users. By the way, the Smithsonian Institution in Washington (the world's largest!) has nothing on us! PokemonGO has given them 6 Stops...and the Walden House has 1 Stop! 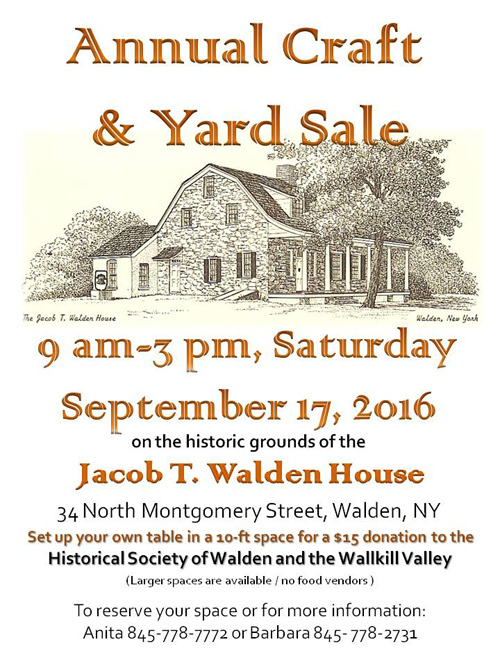 The Jacob T. Walden House, a 1760s stone house became the home of The Historical Society of Walden & the Wallkill Valley in 1958. Thanks PokemonGO for including us! Thank you Players for finding us and hope you'll call for an appointment. ago and been studying, collecting, and appraising antique quilts since 2003. Her interests include researching regional quilt patterns of the mid-19th century. 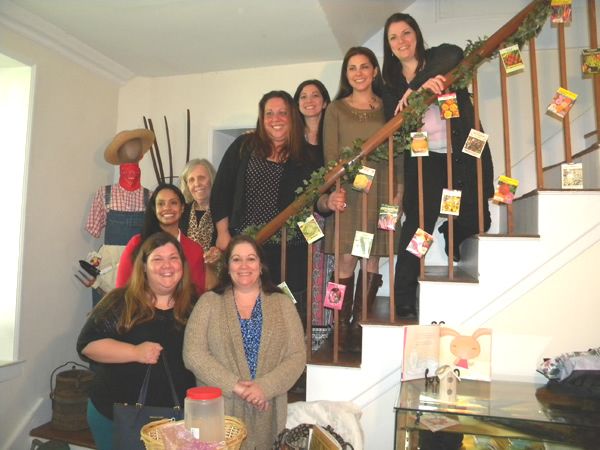 Photos from our Annual Christmas Tea! to all our members who so generously provided Christmas cookies and treats! history of a brutal murder that took place in Walden in 1917! We hope to post his slide show in the future. Thank you Walden Police Chief Jeffry Holmes for a great & informative presentation on September 16th. the world and interacts so differently. 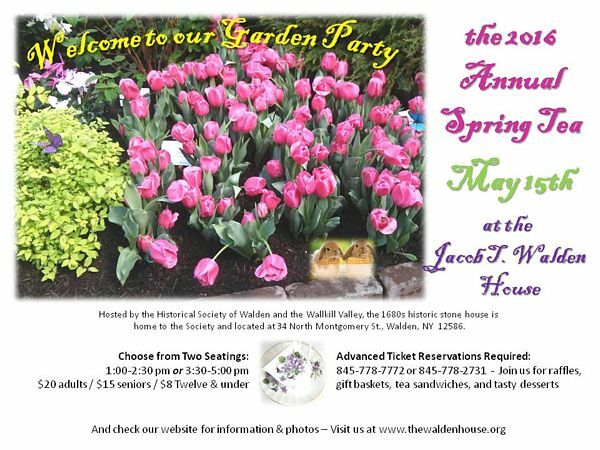 choosing the Jacob T. Walden House for their May Meeting! as our Guest Speaker on Wed, April 15 th. Thank you for being a part of a great year! 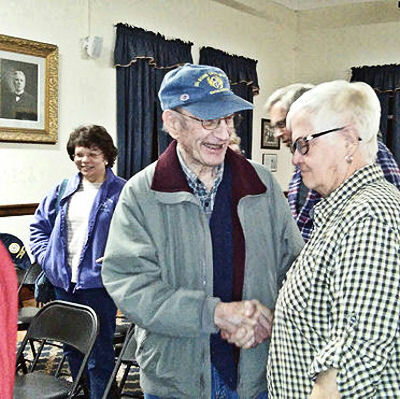 Dave Lustig & John Cameron were guest speakers at our special Veterans program in Nov.
Mountains, based on her research and book with co-author, Bob Larsen, An Unforgiving Land. true lessons of the meaning of freedom in America. 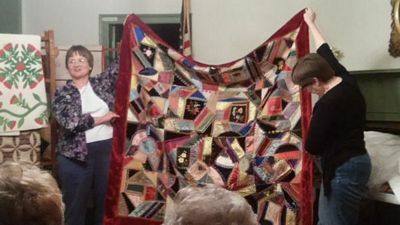 An unexpected surprise at the end of the evening, a gift to the Historical Society! Thank you. The Temple has asked us to help create a display of the history of the property in earlier days before the Temple. The Temple is at 12 Edmunds Lane, Walden. Ray is pictured with Society VP, Anita Vandermark, following the program. 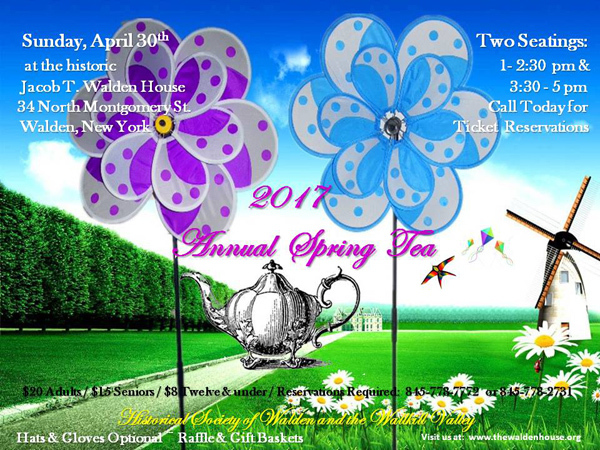 fundraiser possible in May... and our thanks to everyone who participated! Ming Jie's House Chinese Restaurant & Bar is located at 47 Main Street in Walden. 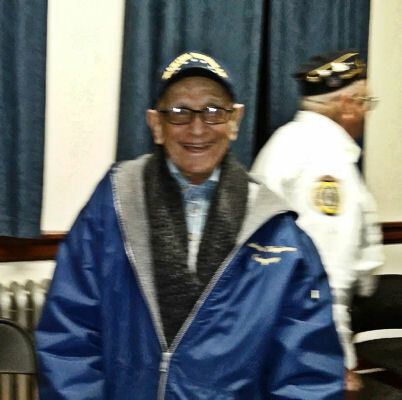 Veterans Day Program on Wednesday, Nov 20th. 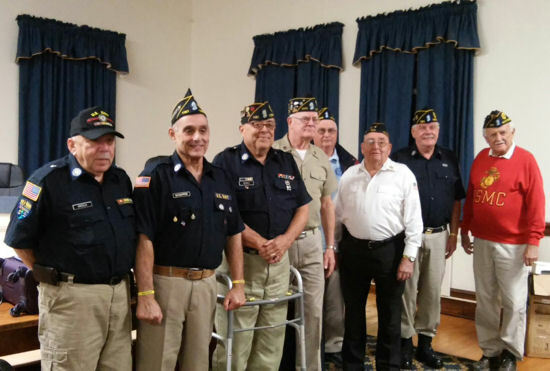 David C. Lustig, Jr. relayed stories from WWII, as did other guest local Veterans, Al Bull, Connie Flickenschild, Sam Liebman, Mickey Millspaugh, and Larry Yeaple, and a very special and moving tribute by Orange County Legislator, Mike Anagnostakis. We salute all our Veterans from every conflict and sincerely thank you for your service! 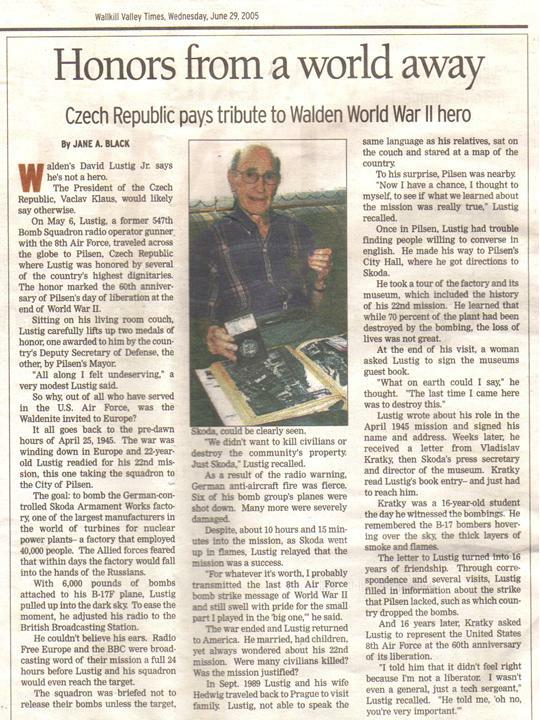 Dave Lustig neglected to tell you that in 2005 he was honored by the Czech Republic for his service in WWII. This article appeared in the Wallkill Valley Times in June of 2005. A New Hat for the Shafer House! 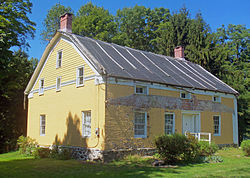 part of the Jacob T. Walden House property. that says something for the quality of their work! "Enterprise & Courage: Civil War Years at Mohonk Lake"
Thank you all for stopping by our booth! in the bottom right of this photo block of slides, click on it to be redirected and then choose "Harvest Fest"). And this was just September! Sarah LaCasse, Thalia Aviles, and Brian Stabner. and a visit on Sunday, July 14th from the Chinook Society. 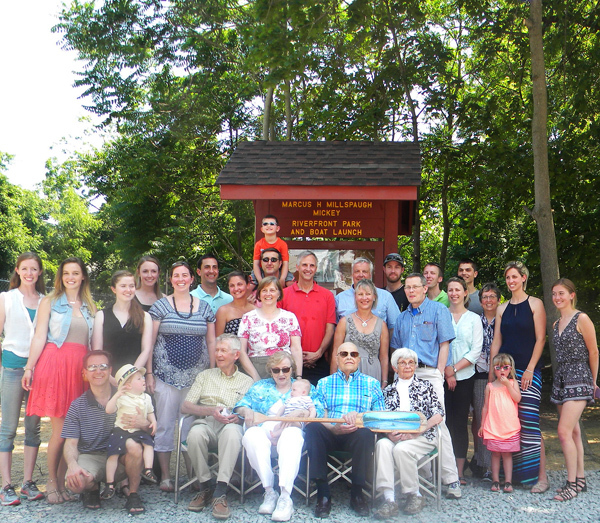 Annual Picnic on the Porch, July 18, 2012.
cool picnic with a lovely breeze and no rain at all! Thank you to Ms. Rosemarie Werkman for a full house program on her book, Love, War and Remembrance, at the Walden House, Wednesday, June 20, 2012.
and signed books following the program. On Saturday, June 16th, the Historical Society had the pleasure of meeting very special guests-- Rev. 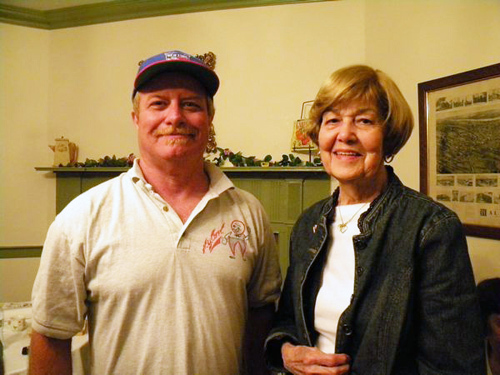 John and Marion Walden from Norwich, UK, as they visited the United States. Rev. 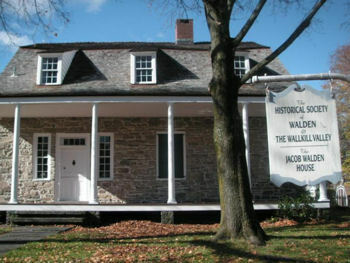 Walden has been in touch with the Society for a few years and had expressed interest in touring the Jacob T. Walden House. Village of Walden Mayor, Brian Maher, stopped in to officially welcome them. scones (from Sue's Sweet Sensations Bakery, of course) and tea! recently named Samuel Phelps, Jr. Service Award recipients for 2011. A full house awards program was held on Thursday, January 12th, at the Walden Municipal Building where each was presented with a plaque. Mickey is a current Trustee of the society and Dave is a former Trustee. We also congratulate Jody Lynn who received a Volunteer-of-the-Year award, Darlene and Mike Ciardullo of Ciardullo Printing for years of service in the Walden community, and William Holmes, who received the Ronald I. Jacobowitz Youth of the Year award. Guest speaker was Mr. Louis Heimbach. Our Congratulations to all! Thank you to Lt. George Brown of the Walden Fire Department, Orange Hose Company. 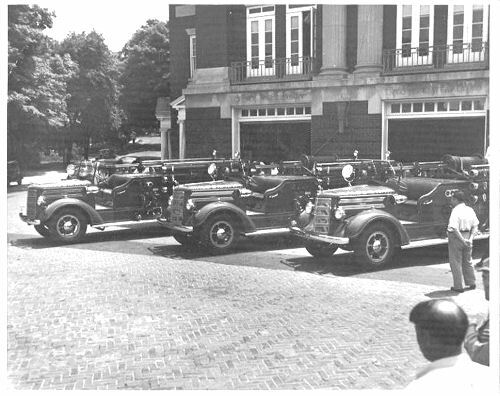 Enjoy photo highlights from the Oct.19th talk on the History of the Walden Fire Department. Congratulations to Trustee Lisa Melville and our Historical Society! Wonderful participation in spite of cool weather and rain. Thank you for your donations and visiting our booth. Lt. Col. (R) Sherman L. Fleek on "MacArthur at West Point"
book, Place the Headstones Where they Belong. If you missed our event, you can still order his book at Amazon.com. Standing Room Only at Dave Lustig's Book Signing! Wednesday, August 17th. Trustee of the Historical Society, Dave is graciously donate $5 from the sale of everycopy of his new book to our society! 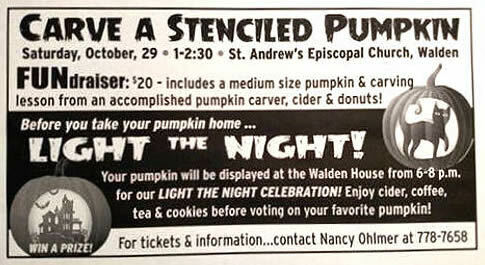 display again several times between now and the announcement of winning bids at Walden's Harvest Fest. Guest Speakers: Lisa Melville on her book, The Grace Murder Case, and Chief Jeff Holmes of the Walden Police Department. If you took photos at this event and would like to share them, we would love to add them to our slide show. Veterans' Day 2010--A very Special Event! An interesting photo donated during the Harvest Fest 2010.
pattern in the road between the monument and the building. and a gift to attending members of a Walden Map of 1905 Reprint! Guest Speaker and long time journalist, Chris Farlekas, November 18, 2009 held our audience spellbound with wonderful first-person stories of his meetings with some of the amazing people of our world from the Pope and Mother Theresa to Michael Jackson, to a local young fellow diagnosed with cancer. All incredible and moving! Thank you! Carl Aiello, Editor and Publisher of the Wallkill Valley Times was our Guest Speaker on the 21st of October. 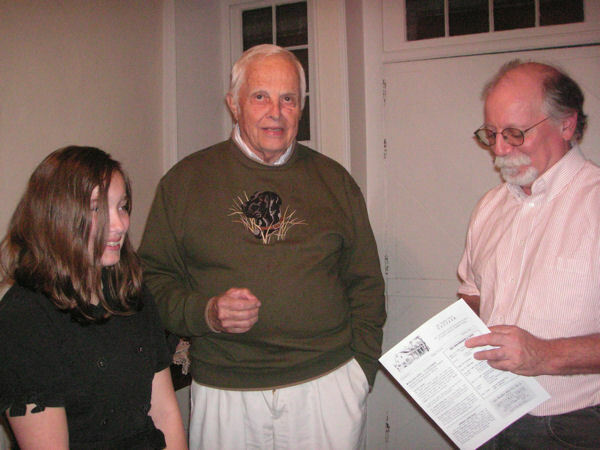 His talk and slide show was on the history of our local area newspapers. Thank you, Carl--it was a wonderful presentation. If you enjoy photos--there are MORE photos of earlier events at this link!